Grow some ‘greens’ for your pet. I bet you just love your pet. Do you spoil it rotten? Do you take it for walks or give it a brush or talk to it for hours on end? Have you ever grown your pet it’s own fresh grass? Pets love fresh greens every now and then. 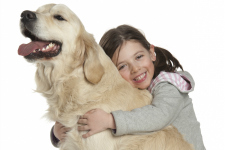 In fact, almost all pets like a little bit of green stuff in their diet and it’s good for them too. Both cats and dogs chew on grass because it helps their digestion, rabbits and guinea pigs like green vegies as well as grass and even gold fish will nibble on parsley to keep them healthy. Birds really love green vegies such as cabbage but you should never feed them lettuce as it upsets their tummy. A really fun project to do at home is to grow your pet a vegie snack. It’s good for their health, keeps them entertained and gives them a bit of variety in their diet. 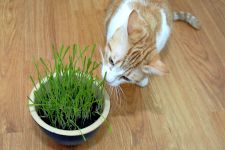 Catgrass (sometimes called ‘petgrass’) is one of the most versatile plants for pets. Although it’s called catgrass it can be used for dogs, rabbits, guinea pigs and even birds. You can buy it at the garden centre already growing in small pots. I always buy two plants and when I bring them home I pot them up into two terracotta or concrete pots that are a about 15 to 20cm deep. The heavy pots stops dogs from knocking them over with their big feet and having two pots means that the pets can have one to nibble on whilst the other one is put out of reach to keep growing. Then, when the first is looking a bit shabby, swap them over so that the first can recover. For rabbits and guinea pigs, use scissors to cut off some of the grass to put in their cage. Cats will chew on the grass themselves and like it if the pot is put up a little bit higher so that they can spy on everyone while they chew. Dogs like theirs next to their water bowl. Be warned, some cats and dogs like their catgrass so much that they chew it right down to nothing! To solve this, get an old wire hanging basket and put it upside down over the top of the pot so that the grass sticks through it; this stops them eating right down to the roots. If the catgrass gets really tall and falls over or looks a bit brown on the ends, get some scissors and give it a haircut. It will bounce straight back. Birds love catgrass too. Canaries, cockatiels and budgies will nibble on it and galahs will totally pull it apart! But, another great green snack for birds is to grow their own birdseed and then let them nibble on the leaves. Click here to find out how!